• View topic - What's Your Favorite Pokemon/Game/Etc? Post subject: Re: What's Your Favorite Pokemon/Game/Etc? Last edited by Pikachu127 on Sat Feb 05, 2011 6:17 pm, edited 1 time in total. Luigi is cool and all, but this is a thread for posting favorite Pokémon related stuff, and he isn't in the Pokémon games. The purpose of this thread is to list your favorite pokemon, pokemon game, FAVORITE NON PKMN CHARACTER, favorite season of the anime, and so on. Please try to keep any arguing to a minimum. Should've been more specific, then. 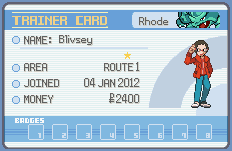 Oh well, new Non PKMN character is Red. I've never actually played the 3rd generation on gameboyadvance yet. only played that generation on computer. everything else i have played on the console. My favourite game that is actually not a demo: Any game that allows you to run without pressing and holding the b button. reference to pebble version. lol. Heart Gold!!! just tap the running shoes button on the touch screen once and voila! you don't have to touch it again!! I like this team better than my starters... hehe. Favorite pokemon? So you're on to me, eh? Well, obviously Zubat, Golbat, Crobat, Gligar, Gliscor, Koromori, Kokoromori, and Cubone. Zubat might be my very favorite, but then Gliscor calls out to me, then Crobat, then Golbat... it gets so hard to choose. I do believe Zubat's my favorite, though. Game-wise? Well, I grew up with second gen and I've played Gold more times than I can count, but I'm not entirely sure. Beats Diamond, that's for sure. Non-pokemon character? What, like in the anime or something? Team Rocket. Always have been, always will be. I was raised on them, after all. First season of pokemon rocked. It was all downhill from there. "What, like a streaker or something?" "Ash, you mean a stalker!" Cracks me up every time. I played almost all pokemon games and my favorite is pokemon emerald. I like them all but the 3° generation was the best generation for the games and for the show as well. The most fun games, the best pokemons and the best plot. The first two generations with Yellow and gold games are awesome; the 4° with Platinum is great and pretty fun but i didn't like the plot and some pokemon very much; The 5° with Black is very good but the almost all pokemons are very strange and ugly. I still didn't finish the game tough. The remakes are great too. Heartgold and Soulsilver are even better than the original games. My favorite pokemon game is Pokemon Emerald. I have a certain predilection for Chimecho. It's a pretty nifty Pokémon, vastly underappreciated. And (as the Musical proves) it looks absolutely dapper in a top hat and bowtie, while carrying a cane. The best Pokemon game? Pokemon Red/Blue, hands down. Rotom has been one of my favorites. Just that happy-go-lucky ghost that can electrify you. FAVORITE POKEMON: Charizard. hey, i've transferred the same one all the way from PKMN Red, to PKMN Black. FAVORITE SEASON: Either the first one, or the Last season concerning Johto. Ash looked so sad when Misty left. Wisdom is not putting a tomato in a fruit salad. Oh, hey, It's been almost two years since I last posted here. Yeah, opinions can change over that amount of time, and that is why I'll update my list here. Favorite Pokémon (pl. ): Shedinja, Slowpoke, Mareep, Flaffy, Porygon, Beedrill, Krabby, Togepi, MewTwo, and Deoxys. Favorite Games: Pokémon Yellow, Green, Silver, Pokémon Pinball, and Pokemon Channel. Favorite Season: I'd have to say the first season, mainly because I really didn't watch that much after that, except for a few movies. Favorite Pokémon (pl. ): Wobbuffet will always be my favorite. So many things that I love converge in to that guy. But I do have some other favourites, and they are: Cloyster, Glalie, Banette, Camerupt, Dragonite, and Aurorus. So...no points for guessing my favourite type. Favourite Non-Pokemon character: I'm always a fan of cool old guys in fiction, and so it should come as no surprise that I love Blaine. Oh, you were expecting Pryce? Well I do love Pryce, but Blaine is riddle themed, and that's awesome. And Blaine is a much snappier dresser, too, which helps. My favourite game was probably saphire. That was certainly the game that I had the best experience with, anyway. So I'm very much looking forward the remake. I liked X and Soul Silver a lot also. I also like the TCG in theory, but I don't like paying for it. Favorite Season: I'm a big fan of the Orange Islands.